The focus of this packet is on subitizing/counting five-frame or dice, shapes or fingers 1-5. There are 24 cards in each game. 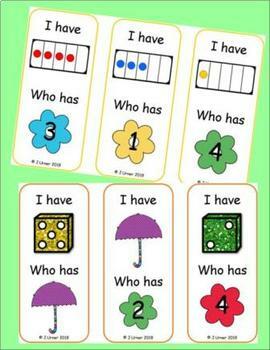 In addition, you will need the six small Flower Activity Cards which should be copied back-to-back in advance. 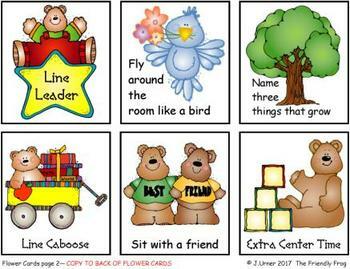 General instructions: (1) Optional: Place the six small Flower Activity Cards in a pocket chart at the front of the class before game play. The flower side should be revealed. (2) Pass out an “I have. 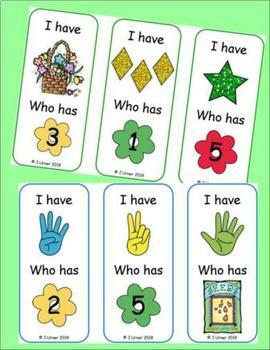 Who has?” card to each child in your class. If you have extra cards, the teacher can keep them and play along, or they may be passed out so that some students have two cards. If you do not have enough cards for your entire class, the children without cards can either share with another student or earn a special privilege, such as choosing which student will begin play of the game. (3) Select a child to begin play by reading his/her card. S/he will need to say both the quantity and the color of the objects/numeral on her/his card. (4) The student with the “answer” to the first child’s card then reads next. If a spring symbol is called, the child with that particular card comes forward to the front of the class and selects one of the Flower Activity Cards from the pocket chart. S/he then does what is revealed on the other side. Several of the cards indicate special classroom privileges which may be “cashed in” later in the school day. (5) Play continues until all the cards have been read.